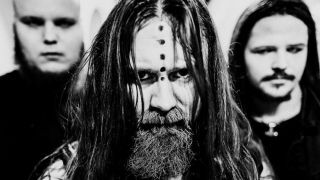 If you feel that music needs a bit of breathing space, or that being left to feel like you’ve been ground into mulch by a malfunctioning tank is a little uncouth, be sure to keep away from Norway’s Vredehammer. Having released the aptly titled single Suffocate All Light last October, the blackened death juggernaut are working on the follow-up album to 2016’s much-vaunted Violator, and band founder/frontman Per Valla (also Allfader lead guitarist and former axeman for Abbath) is gearing up the only way he knows how – by going beyond the riff speed barrier. Having created his own YouTube channel to err… channel his insane guitar skills and practise routines for the new album, Per’s latest display of fretboard frenzy shows him reaching an unheard of 320bpm – a frequency that will involuntarily raise fists and drop jaws. Check out the video below and subscribe to Per Valla's Youtube channel here!